The Government has introduced various profit linked deductions and incentives in order to encourage investment in various industries. Taxpayers who are eligible to claim such deductions/incentives would become zero tax companies or may end up paying marginal tax though they are capable of paying normal tax. The Government also needs regular / consistent inflow of tax which is one of its major revenues to fund various expenses for the welfare of the country. Hence, ensuring not to completely disrupt the intention of introducing such incentives/deductions by taking it away indirectly and also to ensure levy of tax on such zero tax/marginal tax companies, concept of Minimum Tax was introduced. This was initially introduced for companies in the name of ‘Minimum Alternate Tax (MAT)’ to collect minimum tax to be paid by companies who are claiming profit linked deductions in such financial years (FYs) wherein normal tax payable is lower than MAT. Adjusted total income will be computed for MAT by adding and deducting certain specified items. Then, taxed at a rate lower than normal rate of tax is levied on the adjusted income. However, credit for MAT paid in earlier years was allowed to be carried forward and set off in subsequent year wherein normal tax payable was higher than MAT. Alternative Minimum Tax (AMT), introduced for non-corporate taxpayers works on similar principles. However, applicability, manner of computation of adjusted income, exemption, reporting requirement etc are different compared to MAT. As it is evident from the name, AMT is a minimum tax that is leviable alternative to normal tax. Rate of AMT is 18.5% (plus applicable surcharge and cess). AMT is a tax levied on ‘adjusted total income’ in a FY wherein tax on normal income is lower than AMT on Adjusted total income. 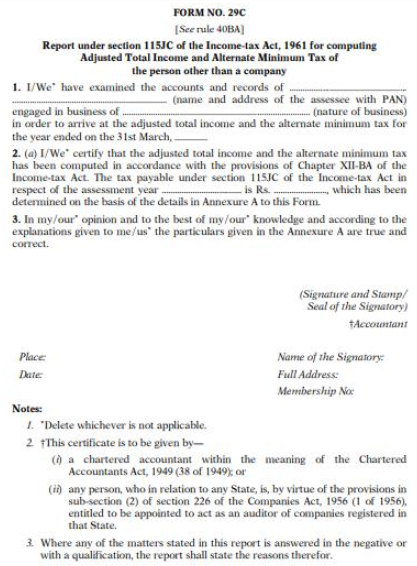 So, irrespective of normal tax, AMT has to be paid by taxpayers to whom AMT provisions apply. Profit linked deduction under Section 10AA – Deduction of profit varying from 100% to 50% is provided to units in Special Economic Zones (SEZs). Based on the above, it can be concluded that AMT provisions are applicable only to those non-corporate taxpayers having income under the head ‘Profits or Gains of Business or Profession’. Further, as mentioned above AMT provisions are applicable only when normal tax payable is lower than AMT in any FY. AMT provisions are not applicable to an individual, Hindu Undivided Family (HUF), Association of Persons (AOP), Body of Individuals (BOI) and artificial juridical person whose adjusted total income does not exceed Rs 20,00,000. Therefore, this exemption based on monetary threshold of adjusted total income is not applicable to LLPs, partnership firms and other non-corporate assessees. Though AMT was introduced to collect tax from zero tax companies, it was also with the intention of having consistent flow of tax to public fund. Therefore, while minimum tax is being levied in an FY wherein normal tax is lower than AMT, in subsequent FYs wherein AMT is lower than normal tax, AMT paid earlier is allowed to be carried forward and reduced against normal tax to the extent of the difference between normal tax and AMT. Balance if any after such set off can be carried forward to subsequent FYs. This concept is called AMT Credit. However, AMT Credit is not allowed to be carried forward for infinity but only upto 10 FYs succeeding the FY in which such AMT is paid. In case of any change in normal tax due to any order passed by income tax department, AMT credit will also change accordingly. Further, if taxpayer has any foreign tax credit (tax paid in foreign countries with which India has bilateral or unilateral tax agreement) to be claimed against AMT, any FTC in excess of AMT shall be ignored. 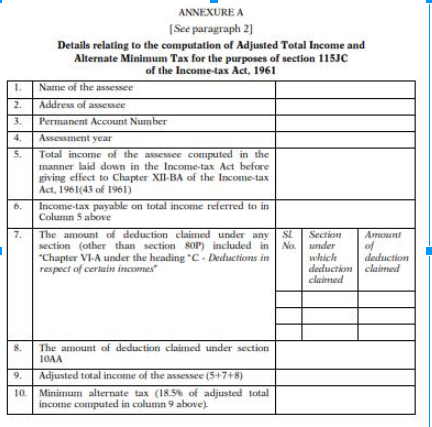 All taxpayers to whom AMT provisions are applicable is required to obtain a report from Chartered Accountant certifying that adjusted total income and AMT have been computed as per provisions of Income-tax Act, in Form No. 29C and furnish the report on or before the due date for filing the return of income. Report can be filed electronically along with return of income.